Was supposed to have smoked a brisket this past weekend, but the timing didn't work out, so I smoked some chicken thighs and a big fillet of salmon instead. 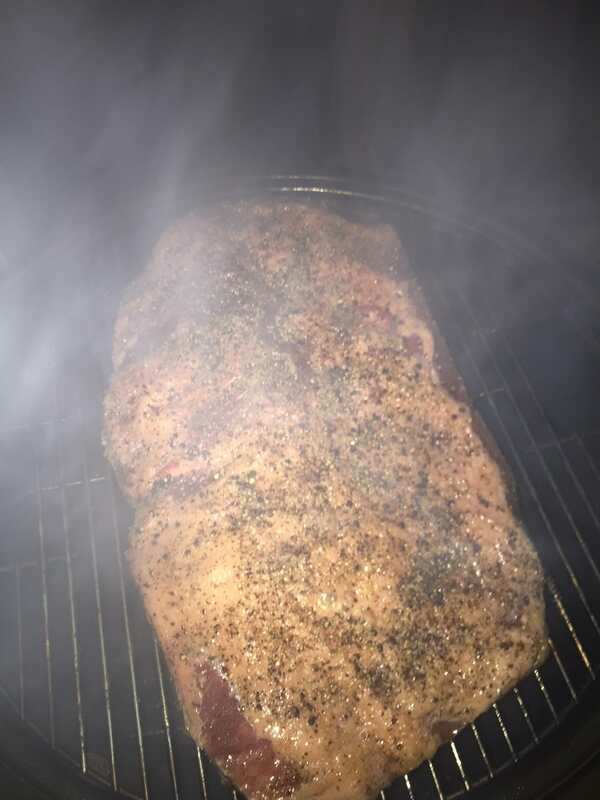 Had already purchased the brisket, so I decided I'd put it on tonight to start the 12 -15 hour smoke. Put it on at 8:45 pm. I won't check it until 9:00 am tomorrow. 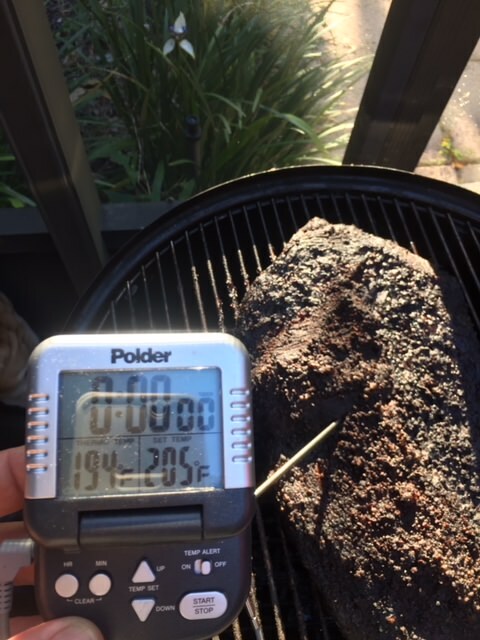 Shooting for a smoking temperature of 215 degrees F. After it's done, I'll put it in a cooler to reset for a few hours. Should be ready around dinner time tomorrow. DANG, Greg.....I JUST got back from Florida. If you can make it, dinner's at around 5:30 pm. Dang it Wolfy, a week too late. There are two WOW's for this photo. It really looks good and the price is twice what I paid two years ago for a 4th of July BBQ. Brisket is my favorite BBQ meat. I usually end up doing ribs because they are easy. I don't recall what I paid for my last one, it was a few years ago. 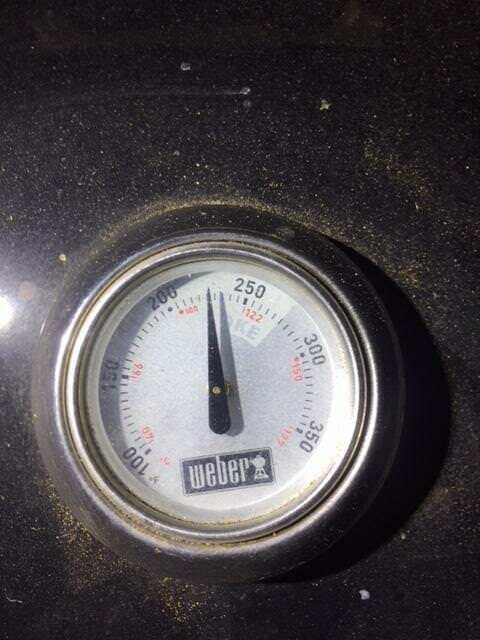 Last night before I went to bed I checked the smoker temperature, it was 240 degrees at 10:47 pm. 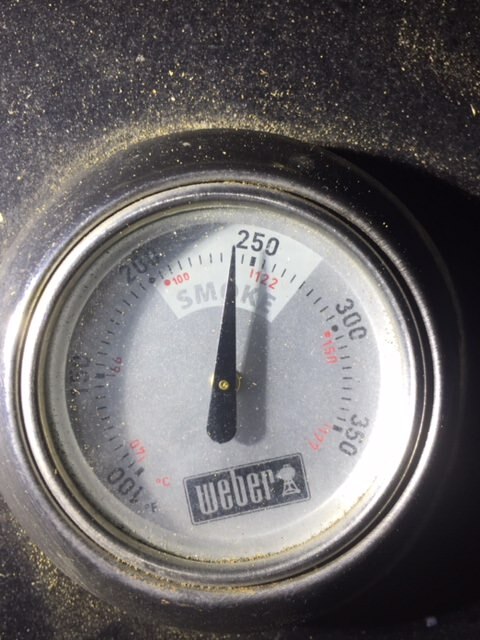 Woke up this morning and checked the smoker temperature, it was 226 degrees at 6:05 am. Only a 14 degree drop in a little over 7.25 hours. 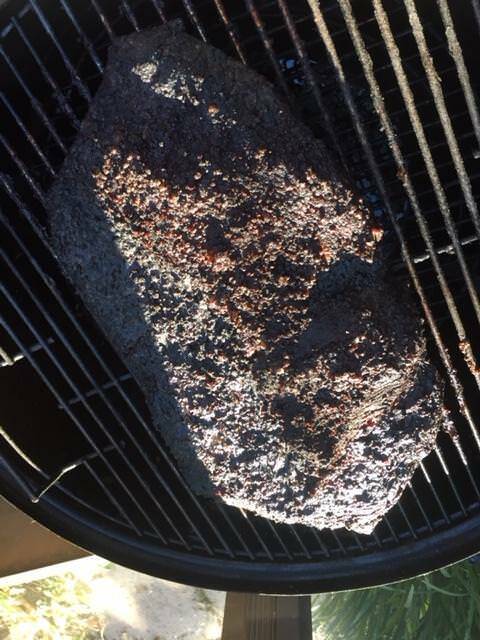 First opening of the smoker to look at the brisket at 8:45 am this morning, 12 hours from when I put it on. Took its temperature, 194 degrees. 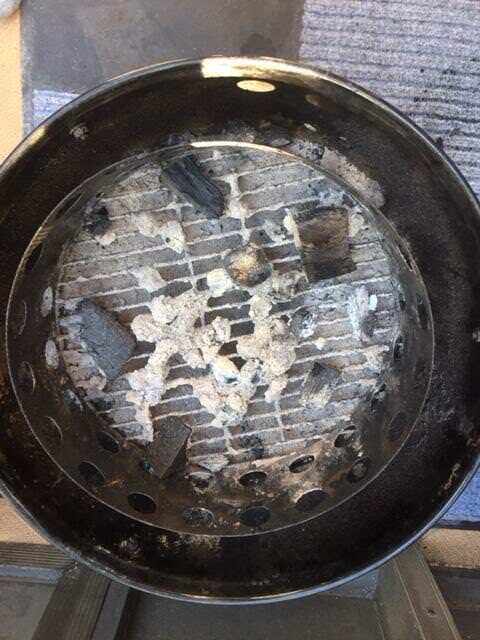 The fire had nearly died out, so started up some new coals. 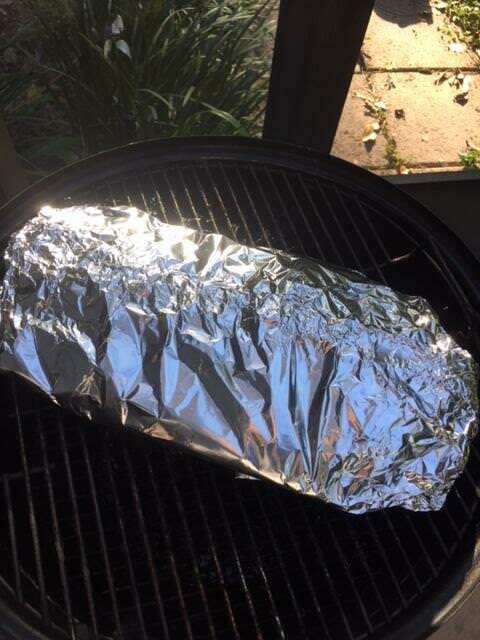 Wrapped the brisked in a double layer of aluminum foil and set it back in the smoker. Put in a temperature probe and set it to alarm at 205 degrees. Set to alarm at 205 degrees. Alarm went off around 10:30 am. 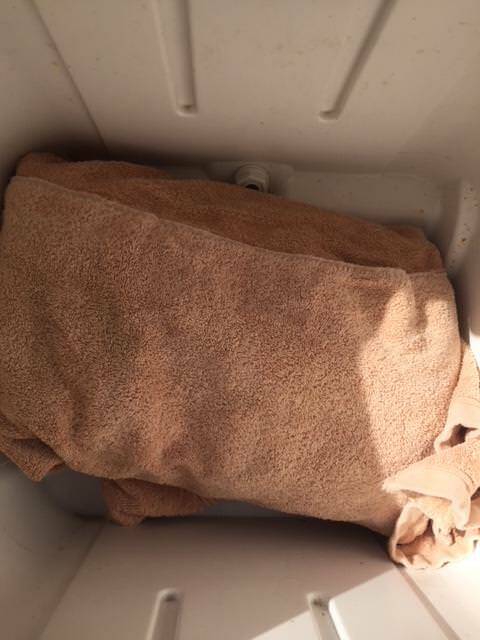 Pulled the brisket off and wrapped it in a double layer of bath towels and put in a cooler to rest for a few hours. 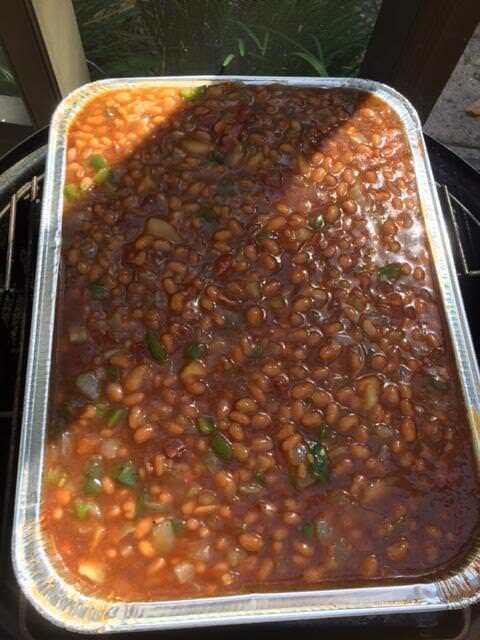 Made up some baked beans to smoke after pulling the brisket off of the smoker. Enough for everyone. Trying a new recipe. #10 can of Bush's Baked Beans, a cup of brown sugar, one cup of Sweet Baby Ray's BBQ Sauce, one pound of bacon, sliced into 3/4 inch pieces and browned, one whole onion and green pepper cooked in the bacon grease, a little worcestershire sauce, prepared mustard, cayenne, some rub mix, and the kicker, two cans of Apple Pie Filling. The pre-smoked taste got a high nod from Stacy, pretty good stuff. Looks like I'll be having dinner a little early today. That looks great and the bean recipe is one I will try. 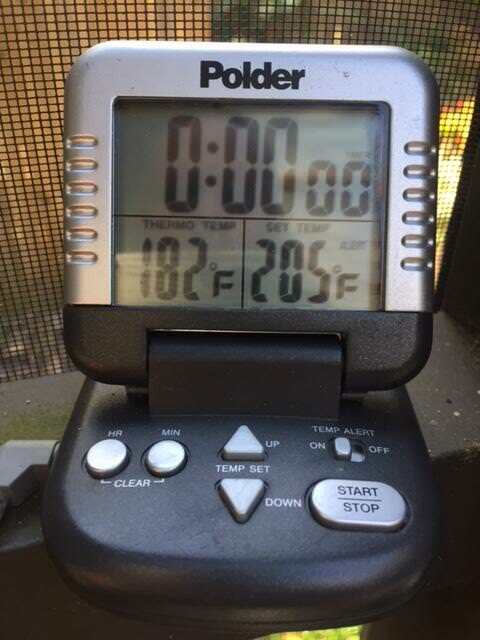 It's great that your charcoal smoker held temperature that well. The brisket turned out really good and moist. Most of it got eaten by 6 adults for dinner. I really like the baked bean recipe, I had two helpings, as did most everyone. Stacy made up a great batch of her homemade coleslaw to round out the meal. The only change I made to the recipe is to use one pound of bacon for a double batch, as opposed to 6-8 slices, and smoked it for 3.5 hours at 250 degrees instead of cooking it in the oven or on the stove-top. That sure looks good chief Greg. The brisket looks great, but those BEANS! Thanks guys, appreciate the comments. Still have some beans left, but the brisket is all gone. We should try this next meet up. I'll bring the meat. Sounds like a plan Spyder. Wow. What a delicious looking piece of patience! Is this a Weber grill or vertical smoker type thing? Yeah I do guess it is the smoker- since you did say smoked brisket. 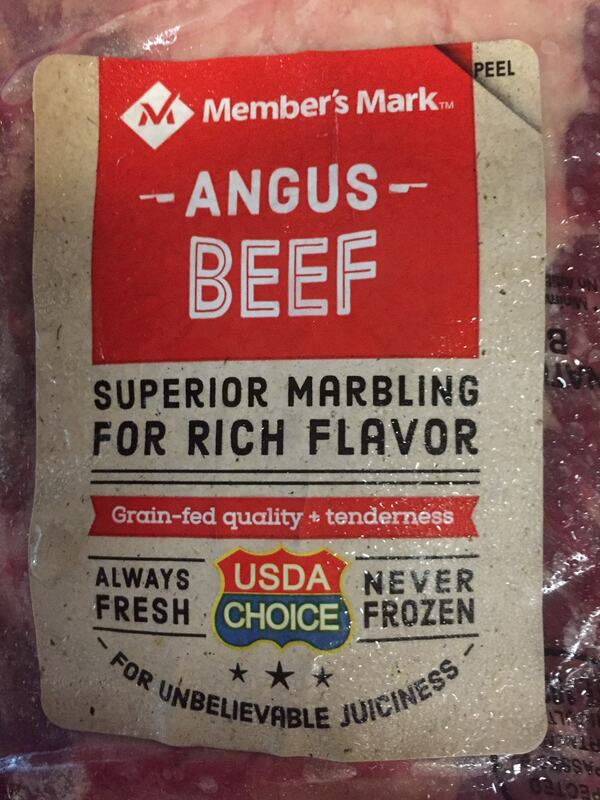 However, the pic of the sliced beef has been appearing to me in my sleep. Such a nice looking char. But then again the Weber grill is a do-it-all tool...and what I use. TBH I'm still hooked on smoke baking that darn corned beef. I think what you are referring to as the 'nose' of the brisket is actually called the 'point cut.' The larger, less fatty portion is called the 'flat cut.' I have heard the 'point' referred to as the 'deckle,' but that term is seldom, if ever, used in this day & age. 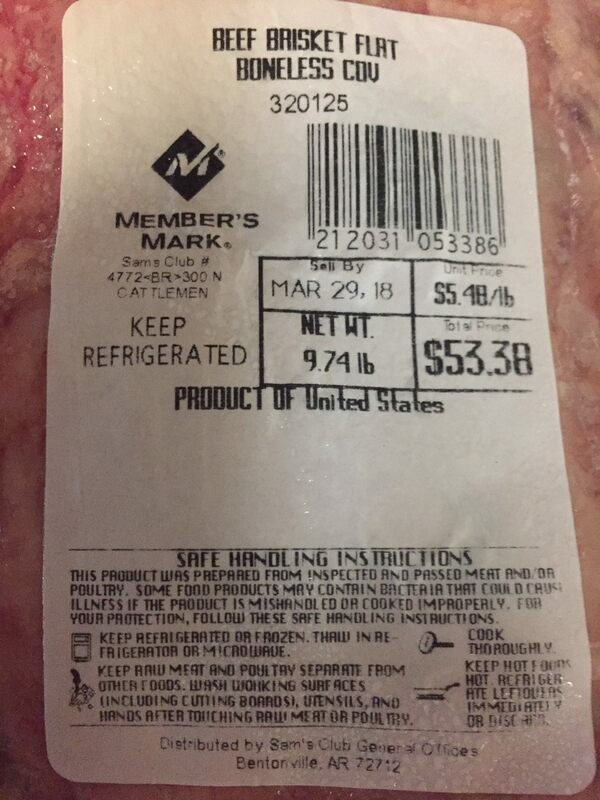 As far as I know, there are only two true cuts in a brisket....the flat and the point. Try smoking a point cut for a longer period of time at a lower temperature.....mor e time will melt out more of the fat and the end result will be the best tasting & tenderest brisket you've ever had in your life! Unk, thanks for the comments. This is a vertical smoker made by Weber. It's called a Smokey Mountain Smoker 18". I've had it for 8 or so years now. Love how it can be setup to maintain a very long, consistent temperature, smoking session. I don't own a Weber grill, but I believe folks do successfully use those as a smoker. 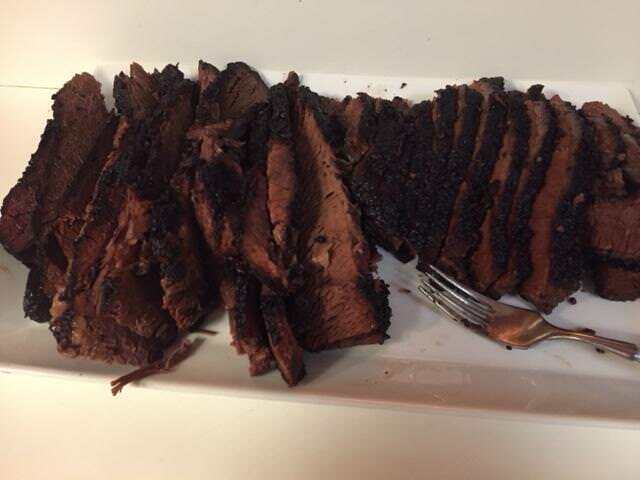 I like all of the brisket, flat or point. It was all very tinder and juicy. I trimmed the thickest part of the fat to about 1/8" to 1/4" of fat and smoked it fat side up over a long period. Those fat juices penetrate the meat and makes it very tender. Just make sure to carve the meat against the grain and separate the flat and point before carving because the grain of these sections are different. Sorry for hornin' in on your thread, Greg.........just trying to keep Unk from embarrassing himself at the meat counter when asking for a cow nose. No worries Craig, go for it. 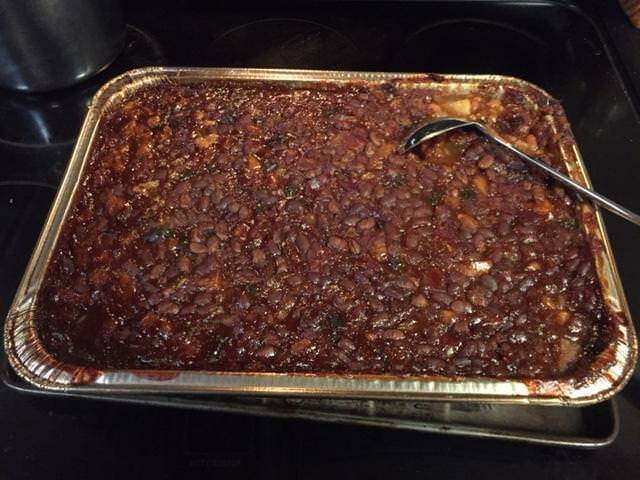 Everything but the apple pie filling is standard for baked beans hereabouts. Interesting. Love me some slow cooked brisket!